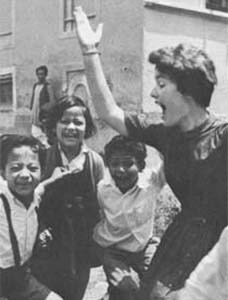 Peace Corps Online: May 9, 2005: Headlines: Friends: NY Post: It was Camelot on the West Coast as the Kennedy clan converged in Los Angeles for the wedding of Bobby Shriver, the nephew of JFK and brother of California First Lady Maria Shriver. May 9, 2005: Headlines: Friends: NY Post: It was Camelot on the West Coast as the Kennedy clan converged in Los Angeles for the wedding of Bobby Shriver, the nephew of JFK and brother of California First Lady Maria Shriver. Peace Corps Online: Peace Corps News: Directors of the Peace Corps: Peace Corps Founding Director Sargent Shriver: Sargent Shriver: Archived Stories: May 9, 2005: Headlines: Friends: NY Post: It was Camelot on the West Coast as the Kennedy clan converged in Los Angeles for the wedding of Bobby Shriver, the nephew of JFK and brother of California First Lady Maria Shriver. It was Camelot on the West Coast as the Kennedy clan converged in Los Angeles for the wedding of Bobby Shriver, the nephew of JFK and brother of California First Lady Maria Shriver. May 9, 2005 -- It was Camelot on the West Coast as the Kennedy clan converged in Los Angeles for the wedding of Bobby Shriver, the nephew of JFK and brother of California First Lady Maria Shriver. The 51-year-old lawyer and artist Malissa Feruzzi, 41, tied the knot at a Roman Catholic church Saturday before a star-studded crowd including Warren Beatty, Annette Bening and Russell Simmons. Maria and Gov. 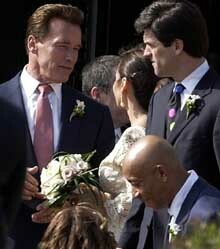 Arnold Schwarzenegger were also there with their 7-year-old son Christopher in tow. Shriver, the son of Sargent Shriver and Eunice Kennedy Shriver, heads DATA, a foundation seeking to reduce Third World debt, poverty and illness.